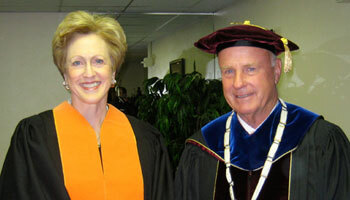 Trisha Pollard and SHSU president Jim Gaertner. Trisha Pollard relayed a simple message to outgoing Sam Houston State University students Saturday. The vice chair of the Texas State University System Board of Regents and 1974 SHSU graduate delivered the commencement address to 1,344 students during morning and afternoon ceremonies at Johnson Coliseum. Combined with Friday evening’s 310 graduates, Saturday’s graduates (630 and 714) were among a record 1,654 students to receive diplomas during spring commencement. Pollard, now a Houston resident, relayed her message before standing room only crowds in the 6,100-seat coliseum as family and friends applauded and cheered throughout the ceremonies. Pollard spoke of the commencement speaker’s address upon her graduation from law school in 1980. Pollard also shared a past experience concerning her now teenage son, Jonathan, while he was in kindergarten. “I spent many of my lunch hours going to his school so I could read to his class,” she said. “I told the children, ‘Reading is the magic key that takes you where you want to be,’ and near the end of the year I gave them blank keys. The boy then repeated back to her the phrase she had used so long ago in his kindergarten class. Bringing her focus to Sam Houston himself, Pollard quoted Gen. Sam Houston. Acknowledging the current technology abundance today, Pollard reminded graduates that there is no substitute for experience. “Too many young people today equate technological know-how with education,” she said. “Just because you know the difference between Blu-Ray and Bluetooth and can send text messages does not mean you are smarter than our generation. Pollard warned against falling victim to the celebrity craze. Bringing her commencement address full circle, Pollard left the graduates with her final wishes.